John Caldwell Calhoun was born 18 March 1782 in Abbeville District S.C. educated at Yale and admitted to the South Carolina Bar in 1807. Following a term in the state legislature from 1808 to 1809 Calhoun entered the House in 1811 where he quickly became a leader of the "War Hawks" and supported nationalistic legislation after the War of 1812. He served as Secretary of War under Monroe; was a candidate for President in 1824; but was elected Vice-President serving under Adams and Jackson between 1825 and 1832. Breaking with Jackson largely over nullification Calhoun served in the Senate from 1832 until 1844 and became a leading exponent of state's rights and philosopher of nullification. After a year as Tyler's Secretary of State in which he secured the annexation of Texas he returned to the Senate. A brilliant thinker and dynamic statesman Calhoun was too ill to deliver his last speech on the Compromise of 1850; and it was read instead by Senator Mason of Virginia 4 March 1850. Calhoun died in Washington 30 March 1850 to stand as America's greatest state's rights theoretician and one of its most distinguished legislators. John C. Calhoun (SSB(N)-630) was laid down by Newport News Shipbuilding & Dry Dock Co. Newport News Va. 4 June 1962; launched 22 June 1963 sponsored by Miss Rosalie J. Calhoun great great granddaughter of John C. Calhoun; and commissioned 15 September 1964 Comdr. Dean L. Axene (blue crew) and Comdr. Frank Thurtell (gold crew) in command. After shakedown and training along the Atlantic coast John C. Calhoun began operational patrols 22 March 1965. 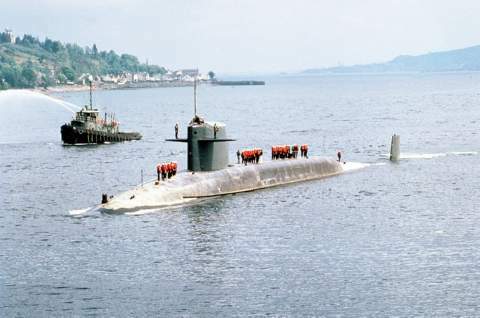 Assigned to Submarine Squadron 18 she deployed on classified undersea patrols to bolster the continuing "keeping the peace" efforts of the Navy. Armed with deadly far ranging Polaris missiles this nuclear-powered submarine helps maintain the freedom of the seas by guarding them from beneath the waves. Moreover the lethal might of her ballistic weapons makes her a powerful deterrent against any potential aggressor; no matter how far from global waters the threat to world peace might be John C. Calhoun stands ready to meet the challenge. At present she continues her patrols as part of the mighty undersea deterrent force. [Transcriber's note: John C. Calhoun was built with the 2500-mile range Polaris A3 and was refitted with the Poseidon missile between 1969-78 and the Trident I missile in 1979-82.